Grab a couple of champagne flutes, drop in a small handful of pomegranate seeds and gently muddle them until they release their juice. Top with Prosecco or other sparkling wine (Champagne, Cava, etc.) 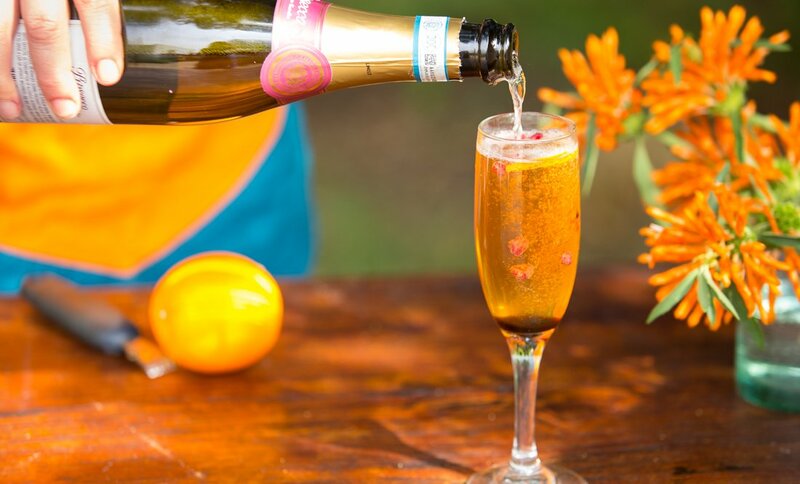 or even just sparkling water, and swirl in a splash of pomegranate syrup so that it sinks prettily to the bottom. To make the pomegranate syrup, we take a few tablespoons of pomegranate molasses, which is generally quite sour, and cook it down with a bit of water and honey until it’s the sweetness we like and a syrupy consistency. Alternatively, you can find pomegranate juice just about anywhere these days. Reduce 2 cups of juice until you have only 2/3 cup left. Add some honey to sweeten and cook a bit more. Remove from heat, cool, and place in a squeezy bottle. Use this to administer the pomegranate syrup to your cocktails! Top with a few whole pomegranate seeds for a festive look, and add a curl of orange zest if you’re feeling it.